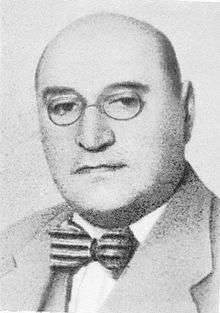 Adam Czerniaków (30 November 1880 – 23 July 1942) was a Polish-Jewish engineer and senator, and head of the Warsaw Ghetto Judenrat. He committed suicide in the Warsaw Ghetto on 23 July 1942 by swallowing a cyanide pill, a day after the commencement of mass extermination of Jews known as the Grossaktion Warsaw. He was born on 30 November 1880 in Warsaw, Poland (then part of the Russian Empire). Czerniaków studied engineering in Warsaw and Dresden and taught in the Jewish community's vocational school in Warsaw. From 1927 to 1934 he served as member of the Warsaw Municipal Council, and in May 1930 was elected to the Polish Senate. On 4 October 1939, a few days after the city's surrender to the Nazis, Czerniaków was made head of the 24 member Judenrat (Jewish Council), responsible for implementing Nazi orders in the new Jewish Ghetto. As the German authorities began preparing for mass deportations of Jews from the Warsaw Ghetto to the newly built Treblinka extermination camp in July 1942, the Jewish Council was ordered to provide lists of Jews and maps of their residences. On 22 July 1942, the Judenrat received instructions from the SS that all Warsaw Jews were to be "resettled" to the East. Exceptions were made for Jews working in Nazi German factories, Jewish hospital staff, members of the Judenrat with their families, members of the Jewish Ghetto Police with their families. Over the course of the day, Czerniaków was able to obtain exemptions for a handful of individuals, including sanitation workers, husbands of women working in factories, and some vocational students. He was not, however, despite all his pleading, able to obtain an exemption for orphans from the Janusz Korczak's orphanage and other ghetto orphanages. The orders further stated that the deportations would begin immediately at the rate of 6,000 people per day, to be supplied by the Judenrat and rounded up by the Jewish Ghetto Police. Failure to comply would result in immediate execution of some one hundred hostages, including employees of the Judenrat and Czerniaków's own wife. Realizing that deportation meant death, Czerniaków went to plead for the orphans. When he failed, he returned to his office at 26/28 Grzybowska Street and took one of the cyanide capsules he had been keeping for just such an occasion. He left a suicide note to his wife, reading “They demand me to kill children of my nation with my own hands. I have nothing to do but to die,” and one to his fellow members of the Judenrat, explaining: "I can no longer bear all this. My act will prove to everyone what is the right thing to do." He was succeeded by his deputy Marek Lichtenbaum. Czerniaków kept a diary from 6 September 1939 until the day of his death. It was published in 1979 and has been translated into English. His wife, Niunia (dr Felicja Czerniaków), survived the war and preserved his diaries; their only son, Jaś (Jan), fled to Soviet territory but did not survive the war. Adam Czerniaków is interred in the Okopowa Street Jewish Cemetery in Warsaw. In the 2001 Warner Bros. motion picture, Uprising, actor Donald Sutherland portrayed Adam Czerniaków. Excerpts of his diary are featured in the 2010 documentary film A Film Unfinished. ↑ Israel Gutman, Resistance. Houghton Mifflin. p. 200. ↑ Gutman, Resistance, p. 203. ↑ "Adam Czerniakow and His Diary". Holocaust Research Project. Retrieved 2011-09-28. Hilberg, Raul (1999). The Warsaw Diary of Adam Czerniakow: Prelude to Doom. Chicago, IL: Ivan R. Dee. ISBN 1-56663-230-7. Lichten, Joseph L. (1984). "Adam Czerniakow and His Times". The Polish Review. 29 (1 & 2): 71–89. JSTOR 25778050.